Wilin Rosario hit his 5th home run of the season on Tuesday night against the Diamondbacks. The blast was his first since June 6th. Rosario is splitting time with Nick Hundley at catcher right now, and Hundley is playing quite well. 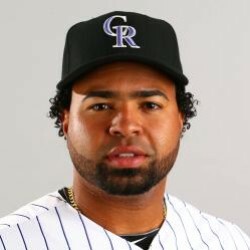 Playing part time certainly has not helped Rosario's cause. He is only one year removed from being the promising young player who hit over 20 home runs two seasons in a row. Until he has a chance at seeing consistent playing time don't bank on that player showing back up.